* Jean-Frédéric Dufour leaving Zenith for Rolex. With the horological storm that is Baselworld slowing calming down, we thought this might be a quiet news week; however, that all changed when Grégory Pons broke the news on Business Montres that Jean-Frédéric Dufour, current CEO of Zenith, was leaving to become the CEO of industry giant Rolex. Dufour has successfully led Zenith’s revival since 2009 when he took over from Thierry Nataf. *Richard Mille ambassador Bubba Watson wins US Open for the second time in three years. The maverick left-hander is reported to have never had a lesson and plays what he calls “Bubba golf,” a blend of imagination, talent and buckets of self-confidence. *Audemars Piguet celebrated the launch of the Royal Oak Offshore collection in Miami with brand ambassador and professional NBA basketball player, LeBron James. The launch took place on the 7th of April at the Pérez Art Museum, Miami. * Zenith presents the Academy Christophe Colomb Hurricane Revolución collection with three timepieces paying tribute to three revolutionary South American figures: Simón Bolívar, Ernesto “Che” Guevara and Emiliano Zapata. The Christophe Colomb model features a patented, gimbaled regulator, chain-and-fusée energy transmission, and fast-beating 5 Hz (36,000 VPH) balance. * Montblanc celebrates the 90th Anniversary of the Meisterstück pen. The iconic pen with its star-capped cap was first launched in 1924. For more, please check out this excellent article by Anthony DeMarco on Forbes: montblanc-celebrates-90th-anniversary-of-the-meisterstuck. 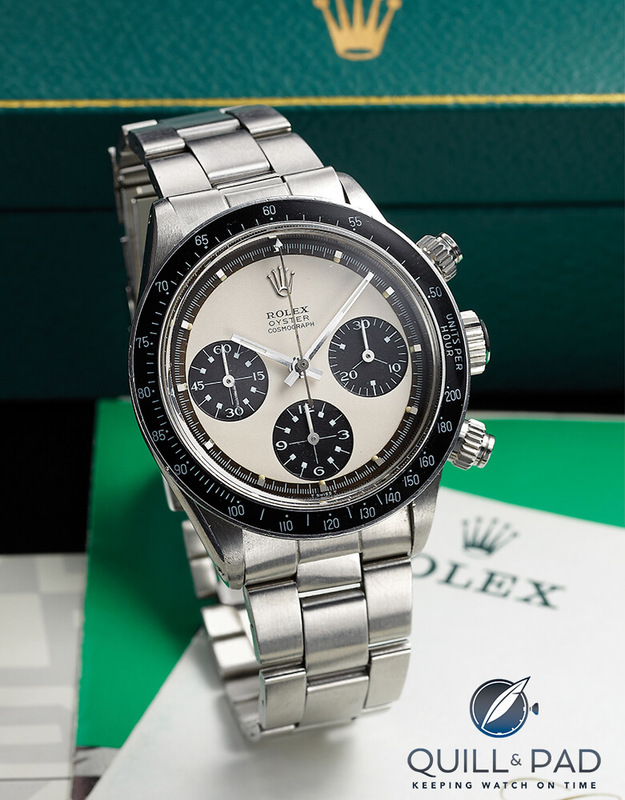 * A Rolex “Paul Newman” sold for $231,750 at the recent Antiquorum auction in New York. The much sought-after chronograph went under the hammer after a passionate bidding war between eight phone bidders and a room bidder. The price paid was more than three times its higher estimate. The same auction also featured a racing suit and helmet worn by Paul Newman in the 1980s. They sold for $56,250, proving the value of star power. *Jaeger-LeCoultre presents its new High Jewelry Collection, which testifies to the brand’s mastery of rare arts and crafts since 1833. You can see and learn more about the brand’s Hybris Artistica collection in When Art Ticks: Why Jaeger-LeCoultre Is A Master Of Art And Mechanics. *Jaeger-LeCoultre is in the news again with a new Geophysic Chronometer 1958, which is available in steel, pink gold or platinum. JLC launched the original Geophysic in 1958 to commemorate the International Geophysical Year. For more information, please check out this excellent article on Hodinkee: Introducing The Jaeger-LeCoultre Geophysic 1958 (Live Photos, Full Specs, Official Pricing & Availability). * For our Australia-based readers, and there are many more of you than we expected (thank you one and all), Hublot held the first Australian Ferrari Racing Days with an opening party at the Sydney Opera House on the 11th of April. A new Ferrari F1 car was on display as well as a MP-05 LaFerrari watch. * Digital Luxury Group (DLG) announces the acquisition of Luxury Society. Headquartered in Geneva, with offices in New York and Shanghai, DLG’s Luxury Society boasts 30,000 members from 150 countries. *F.P. Journe announces role as official watchmaker for France-China 50, commemorating the 50th anniversary of diplomatic relations between the two countries. As a patron of the anniversary initiative, François-Paul Journe designed two watches, a men’s Octa Automatique Lune and ladies’ Elégante with jade dial, which will be exhibited at events throughout the year. From Frank Geelen on Monochrome: RGM Take The Tourbillon Back to its Roots… Sort Of. Ariel Adams on aBlogtoWatch explains the Bulgari Octo Finissimo Tourbillon Watch Hands-On: Thinnest In The World. And The Watch Lounge’s Tom Mulraney reports on the De Bethune DB29 Maxichrono Tourbillon Hands On. We wish you an excellent Easter break.